Emilie Dhir, Lexington School class of 2013, shares her lessons on courage from the Southwest trip in this honest reflection. As she prepares for college admission for Fall of 2017, she explains why she’s ready. An eighty foot drop and a girl terrified of heights. My heart raced, my stomach knotted up, and my eyes darted as I looked for an escape. 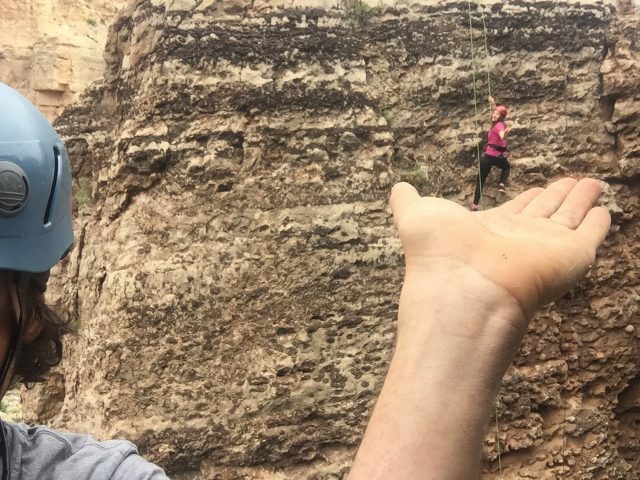 However, when it comes to rappelling in Zion, there is only one escape route. Straight down. In the last weeks of our middle school careers, my eighth grade class took a trip to the Southwest. This trip was legendary at our school, something we looked forward to since lower school. Although I was excited, I was painfully nervous. Per usual, I thought of all the extreme disasters that could happen, all resulting in my death. At that time in my life, I was not one for stepping out of my comfort zone. And rappelling . . . definitely miles out of my comfort zone. On the third day of our trip, my grade split up into our pre-assigned groups. My hands were already clammy as we piled up into the van and drove from the campground to the rappelling site. We pulled into the parking lot. My heart was pounding at the mere thought of what was coming. As we put on our harnesses, our guide went over all the safety procedures. I, of course, heard these words as all the things that could go wrong. Great. Just what I needed. As my peers jostled for their spot in line, I naturally fell last in line, not eager to take my turn. As each classmate rapelled, I would hear them shout with glee as they descended. I could not share their happiness. All I could do was will myself not to vomit. I’m next in line. My body tenses as I peer down the massive drop and see an obstacle. A boulder. I almost completely tune the guide out as he explains that I’ll need to swing around the boulder to properly re-center myself on the path downwards. While the guide is giving me instructions, all I hear is my heart pounding in my ears. “All set! You are good to go!” he says with an enormous grin. I weakly smile back as I take my first step toward level ground. After twenty feet down, I reach my menacing opponent. “Alright now, just swing around the boulder and you’ll be good.” Yeah, easier said than done. I feel frozen. I hear a few, “You got this” and “Come on, Emilie” from down below. Yet again, all I truly hear is my heartbeat. I release my feet. I’m flying. My hands reach their peak of clamminess and my heartbeat is faster than ever. But I feel free. Well, free and horrified. I land safely on the face of the canyon wall and rappel the rest of the sixty feet without hesitation. There was no major celebration as I descended the final feet. I had simply done something necessary for me to move ahead. Everyone had to do it, whether it was out of their comfort zone or not. C’est magnifique! Emilie wrote this from the heart and she did a fantastic job. I share her fear. I still remember the rope bridge in Quenca, Spain. I was too frightened to cross it.